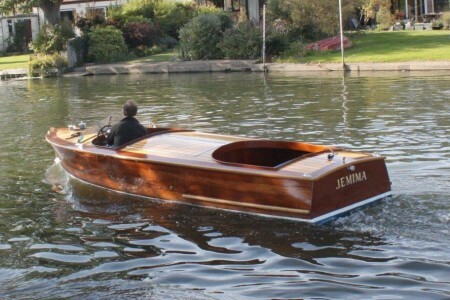 Built in 1928 by Brooke Marine of Lowestoft and named after John Brooke’s granddaughter, Jemima was fully restored by Cox’s between 2009-13 and then used lightly on the River Cam for four years. She is now back at Cox’s and has been revarnished, antifouled, and equipped with new batteries and Victron battery charger. She will have a new BSS Certificate on sale. 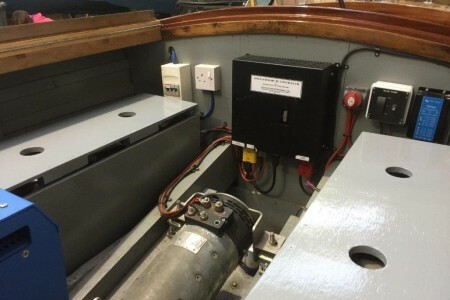 The electric motor and control electronics were supplied by Rupert Latham and installed by Cox’s. Cruising range is 6-8 hours at 4-6 knots with 2.5kw motor fed by eight 6v batteries. She is built of mahogany on oak with ash decking, comes with an overall cover made by Jeckells, storage trailer, and has always been stored over winter in a wet or dry shed. She is in perfect condition and ready for the summer season. The propulsion system requires essentially no maintenance and the overall cover fully protects the varnished deck and hull. The Seacar was Brooke Marine’s answer to the Chris Craft runabouts popular on the Great Lakes. 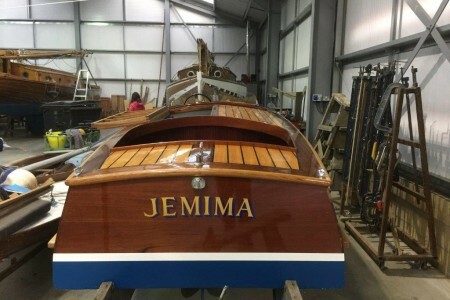 Jemima is 17ft long and has about a 5ft 6″ beam and 2ft draft. 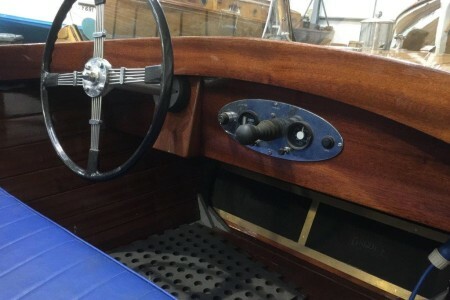 She comfortably seats six, and is fitted with chromed cleats and fairleads, ensign socket, Brooke roundels, mats, navigation lights, etc all remanufactured using the original castings by John Brooke, the great grandson of the builder. The bomb bay doors to the engine room are trimmed with chrome as is the splash screen.